The primary purpose of Pursuing Information Literacy is to inspire individual thinking and application. The book reviews important information literacy and its social significance and the application of information literacy in a number of different sectors. 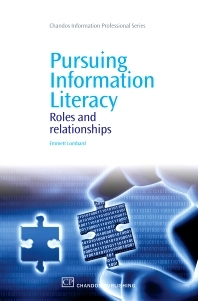 The future of information literacy is explored in concluding chapters. Emmett Lombard is a Librarian, Webmaster, and English Instructor at Gannon University in the United States. He presents his information literacy ideas at international forums, and inspires people to take ownership over their learning.